Every retailer online or offline has a section that showcases the new arrivals at that store. If your online brand introduces new products often, then maintaining this page is a cumbersome task. But you need it, as it one of the most sought-after pages in your retail store. 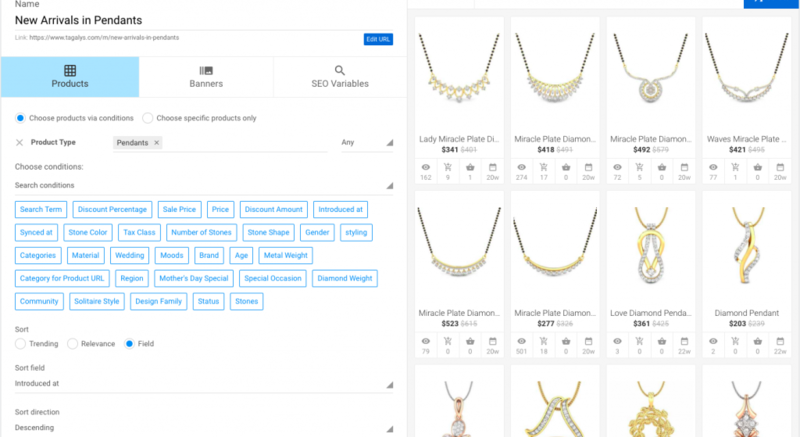 Sometimes, it might even make sense to have a New Arrivals page by category or subcategory if your product catalog has enough products. This is a manual task is most often overlooked as there are constantly added to your store. And if you have managed to manually add products each time to something new is introduced in your store, there is no way you can merchandise this page in the event you want a Hero Product or hide certain products on that page. Fortunately, Visual Merchandising from Tagalys does this for your in a few clicks and whats even more awesome is that you no longer have to ever manually update the page ever again. Choose the Tagalys conditions that will identify products that match this page (in this demo site, we have selected “product type”) and “set the Tagalys Sort order by “Introduced at” descending. If you are promoting this page on an advertisement that shows a particular product and you want that to be the first product on the page, use the “Curate” option and drag & drop that product as the first product on the page. You can also make a page for “Sale or Clearance” in a few clicks and never have to come back to update it again.